How Do You Identify Points on a Graph? Plotting points on the coordinate plane is the foundation of graphing equations! But before you can graph equations, you should be very familiar with the coordinate plane. In this tutorial, you'll see how to identify the ordered pair of a point on the coordinate plane. Plus, see how to figure out which quadrant the point is in! What is the Coordinate Plane? You can't graph a function or plot ordered pairs without a coordinate plane! Learn about the coordinate plane by watching this tutorial. To graph a function or plot an ordered pair, you need to use a coordinate plane, so you should learn all about it! In this tutorial, you'll learn about the x-axis and see where it's located in the coordinate plane. How Do You Plot Points in the Coordinate Plane? 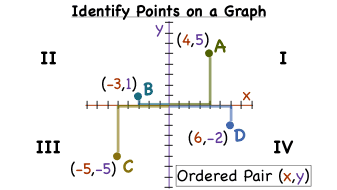 Knowing how to plot ordered pairs is an essential part of graphing functions. In this tutorial, you'll see how to take an ordered pair and plot it on the coordinate plane. Take a look! How Do You Graph Ordered Pairs in Each Quadrant? Plotting points on the coordinate plane is the foundation for graphing equations! Check out this tutorial to get some practice plotting points and identifying which quadrant each point is in.